Kerala VHSE First Allotment 2018, the Kerala VHSCAP Allotment Result for admission to Kerala Vocational Higher Secondary Plus Two courses has been published on June 11, 2018. 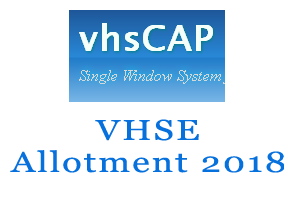 The students may check the allotment result by login to the VHSCAP web site www.vhscap.kerala.gov.in. The students who got the VHSE First Allotment would take the printout of the allotment letter and report to the school to take the VHSE admission for the year 2018-19. Last date to take admission from the school : 13-6-2018 at 3pm. Kerala VHSE First allotment result 2018 is the sure list of candidates who are qualified for admission to the VHSE courses in kerala. The VHSE allotment result is prepared based on the scores obtained from the qualifying examination of the candidates and the option registration given by the candidates after the trial allotment published. The candidates who got an allotment in the VHSE first allotment result must have to report to the allotted school to take admission before 13-6-2018 at 5.00 pm. The candidates who are not included in the first allotment need to wait for the next allotment results published. They can check their rank on the applied schools and the last rank allotted for admission to each courses on that school. The students who got VHSE allotment should have to login to the www.vhscap.kerala.gov.in and check the result. They will get the allotment details like the course and school in the first page. The students must take the print out of the Allotment Letter and it should produce at the time of admission. The students should report to the allotted School with the specified fee,allotment letter and the original certificates of relevant documents. The last date for report to the school for admission is June 13. (f) One Passport size photograph. admission, If the fee amount is not paid within time they will not get admission in other times. Students got the allotment in second or other options may opt for temporary admission. They must report to the Principals of the schools with the related documents and take admission, they do not need to pay fee amount for temporary admission. The students who take the temporary admission can make changes in options within the specified time and wait for allotment in the next VHSE allotments. The students who take temporary admission to Permanent can pay the required fee and take admission confirmation. They must inform to the principal for permanent admission and cancel the higher options they registered.